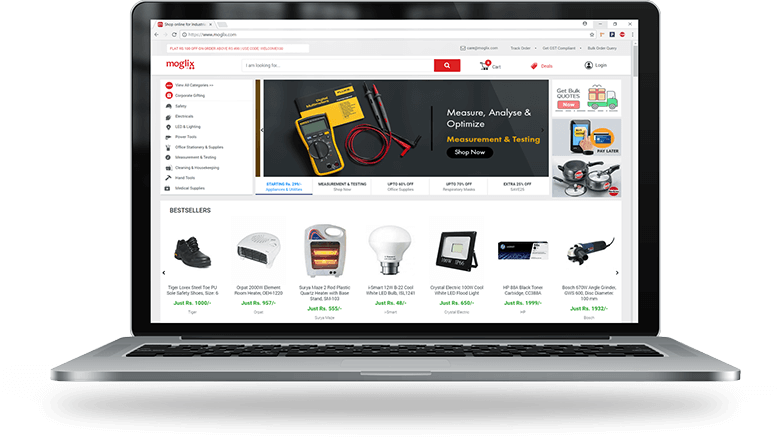 Our e-commerce platform specializing in B2B procurement of industrial products such as MRO, Fasteners, Electrical, Hardware, Pneumatics and Safety items etc. we at Moglix, passionately strive for a comprehensive revolution in the industrial supply operations across the globe. With a mission to tide over the gap between B2B merchants and consumers, our vision documents the development of an exclusive digital-trade ecosystem, tailor made to satisfy the diverse needs of buyers and sellers. Across the globe, Industrial procurement is a very complex subject on account of fragmentation of products & categories involved as well as the scattered supplier concentration. And we have braced ourselves to shoulder the responsibility of providing a smooth and seamless solution to this long standing problem of the industry. Assortment of industry essential products, listed under 30+ categories. SME clients, in addition to 250+ Enterprises & Corporates. Pin Codes serviceable across the country. Last mile deliveries are not of any concern. Supplier base across nation, to address your diverse requirements.